Great guide, accommodations, and travel arrangements. Had a great time on the trip as a result. The tour combined Machu Picchu and Galapagos Islands into a bucket list trip. Our tour director did a very good job. The tour guides on the Galapagos part of the trip were knowledgeable about the islands and their flora and fauna. The ship's crew was very accommodating. I was somewhat surprised at the amount of tipping that we were 'expected' to do - other companies that I have traveled with usually take care of most of that as part of the tour cost. Too much tipping. Too much tipping. Our tour manager, Edward, was fantastic. He went above and beyond to ensure a positive experience. He was especially helpful when my husband and others on our trip experienced altitude sickness. For me, this was "el mejor viejo de me vida" - the best trip of my life. I have done a lot of traveling, including one other trip with Collette, but this trip to South America was absolutely awesome. I will NEVER forget all of the wonderful sights - especially Machu Picchu. I will cherish my memories of this trip forever. The Galapagos was an absolutely amazing experience - the biodiversity, the daily excursions, the ship/crew, food, fun. It was awesome. Our tour manager, Edward, also went above and beyond to ensure an unforgettable experience for our entire group. Highly recommend! The tour manager, Edward, was phenomenal. The trip was awesome - and Edward made it even more fun and unforgettable. Everything about the trip was memorable - especially the Galapagos and the ship and crew. Our tour manager, Edward, was fabulous. He really went out of his way to ensure a great experience and provided individual attention to everyone in our group. Definitely a trip everyone should take! Amazing trip. Wonderful accommodations. Experiencing Machu Picchu and The Galapagos was the BEST. Everyone should take this trip! The trip of a lifetime! Everyone should do this. The service was excellent Our guide Edward was outstanding. Airline scheduling was strenuous. The highlight for the tour was the Galapagos. Collette took care of everything and got us to all the important sites with no hassles. Our tour guide was exceptional. Had lots of information and kept us informed of what was happening the next day. Had a good sense of humor and took care of anything that might come up. Our local guides were also wonderful. I tell all my friends what a great company Collette is and will be traveling with you again. One of my favorites was the day at the Village of Misminay for lunch and being with the people of the village for lunch and witnessing their customs. Machu Picchu and the Galapagos Islands were awesome. It was the trip of a lifetime! Excellent every step of the way. Seeing the animals up close. They were easy to talk to and found the answer fast. But when we emailed and asked a question there never was a answer back. The tour was very well organized, But having a 9 yr old child running around and butting in, pushing people out of the way, and having to babysit him is not what we paid for!,, They don’t understand what is really said or going on. Also having someone who couldn’t walk more than a hafe a block on this kind of tour is so wrong. It takes up the guides time and others who had to help out. The tour guides tried to make it work. But even he was supprised to see this person on this trip. **** The tour guide was very knowledgeable and great to be around. The add on tours at the end were less than good. We really didn’t do anything much but travel and told to shop. The host family seemed nice but we were told that they don’t eat or talk with you “ it is not politically correct “ then how do we get to experience their life. It just felt like being dropped off in a hotel and eating in a restaurant. Our guide spent most of her time in her room. One of the bus drivers on the add on. Drove less than safe, trying to get places faster than needed. Going well above the posted limits. Passing on corners any time is so wrong, I wasn’t sure if we were going to make it back in one piece. The main tour we took was very good, a few minor things but we’ll worth it. We added on a three day extension, this was at best a 1. A family visit where you couldn’t even eat with them, a one person “music” factory, one old lady weaving was the weaving factory. Our great group of travel partners. Collette goes above and beyond in making every trip special. Their tour managers and guides are the best and the accommodations are always top notch. We have been on 4 Collette trips and are planning our 5th. We were at a high point outside of Cusco City taking pictures late in the afternoon and when we turned around Collette had set up tables with linen tablecloths and waiters serving us Champaign, mimosas with fresh mango juice, and chocolates and fresh pastries. They alway go the extra step to make your trip memorable. Tour Guide came from Peru was very good ensured that everyone new what to expect each day. Made sure everyone understood what he had told them. Obtained train tickets for trip to Macchu Picchu All trips had knowledgeable local guides Galapagos Cruise had naturist Guides and hole trip was excellant. Macchu Picchu train journey was thoroughly enjoyable. The sites in Cusco,and Macchu Picchu are a must see. The Galapagos Islands and the guides were spendid, a real joy to see the animals in their natural enviroment. I LOVE THE VARIETY OF EXPERIENCES WE WERE EXPOSED TO, ESPECIALLY THE VILLAGE TRIP NEAR CUZCO. INTERACTING WITH "REAL" PEOPLE IN DIFFERENT CULTURES IS IMPORTANT TO ME. ALSO THE COLLETTE FOUNDATION CHILDRENS CENTER VISIT. Excellent service, great choices of hotels and fantastic guides. I would have given it five stars if it were not for a couple of very repetitive menus in Peru. Beautiful tour! Most memorable was Cusco and the Galápagos with visit of Darwin Center. I would have given 5 stars BUT some people were in no physical condition to be on a tour that precisely warned about some strenuous activities and the necessity to be fit. Do not understand why they were accepted on this particular tour, therefore slowing down everybody and not getting their money’s worth. Excellent service and organisation from start to finish. Had a great tour manager who couldn’t have done any more. Excellent choice of trips and hotels. The Galapagos cruise was perfect and we were able to see all the animals. This tour is a must-do for everyone. Our tour guide *personal details removed by Feefo* was fantastic. He was well experienced and made everything run smoothly. He gave good advice, was very informative, extremely attentive when someone didn't feel well, and seemed omnipresent. He made a nice birthday celebration for one guest and a memorable anniversary party complete with champagne for my wife and I. The hotels were excellent as well. We also enjoyed the local tour guides. They were very knowledgeable and helpful. We enjoyed Peru the most especially the history, ancient ruins, and cuisine. However, guinea pig won't be high on our preferred menu list. Quito was also interesting. The Galapagos were a little below expectations, partly because it was the dry season. This is an amazing building feat. Although our tour was very informative and long enough I could probably spend a lot more time on another occasion soaking it in. Nice trip but Galápagos Islands are not worthy of this trip! We have traveled with collette 4 times and have always had 5 star experiences. This one had some disappointing parts. On a very positive note, our tour manager was wonderful, very personable, knowledgeable and fun. Concerns include the hotel in Cusco which was frightening, no heat, cold, less than desirable section of town. Surely there is a nicer hotel somewhere in Cusco. 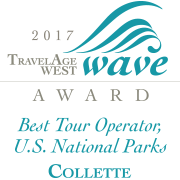 A major reason we choose Collette is the higher quality of travel and the smaller groups. For the first time on a tour, we did not know when the optional excursions occurred and none were explained in detail. We did find out about one and it was wonderful. The other 2 were filled before we even knew about them. The Galápagos Islands were very disappointing. The Legend naturalists and main staff were unprofessional and not helpful and very disorganized. When there was no activity planned, they threw in a panga ride which meant yet another rubber raft ride around an island. We were divided into smaller groups but our naturalist left behind more than half the group, never waiting for everyone. The 5 days at the Galapagos was awful! A half day trip to the zoo would have accomplished the same experience. The housekeeping staff and dining wait staff were wonderful though. I was very glad to leave The Legend and will not recommend that portion of the trip to anyone. We loved Peru and Ecuador and all the activities there. Collette should consider having the option of the Galápagos Islands as an add-on. Perhaps it's great for those who like to snorkel in cold water all day or hike through scrub brush looking for a bird, but many people our age do not want that for the price they pay. Our travel agent, *Personal Details removed by Feefo* was fabulous, meticulous, and deserves a 10+ rating! Hated the Galápagos Islands and The Legend ship with unprofessional staff. This is the lowest rating I've ever given a Collette tour. Hello, thank you for bringing these details to our attention. We appreciate your feedback as it helps us to improve the tours for future guests. We look forward to traveling with you again soon. We wil travel again with Collette!!!! I'm always comfortable and confident with Collette's choices and managers. The tour manager (personal details removed by Feefo) on our Ecuador-Galapagos-Peru trip was exceptional. May well be the best ever in our 25 plus years of tourest travel. The entire tour was grate mainly due to our tour guide (personal details removed by Feefo)....See the wonderful CDs provided as part of the tour by the Galapagos tour ship crew! Overall the trip was one of the best. The tour manager was excellent. Every aspect was very well done. The excursions to the comfort of the beds on the ship and on the hotels. The tour manager went out of his way to show us the true Ecudor and Peru. Every thing was done very professionally. Our mix of tour people was excellent. As above. I loved the blue footed boobies and all the animals, birds, fish etc. and the Inca people and much more. The destinations were great, the experience great, a trip of a lifetime. The local guides and bus drivers were fantastic. Our Collette guide was not what we expected or had hoped for. The tour was fun, educational, beautiful, hectic. Lunch with the local family in Peru was a highlight. Manchu Picchu is amazing, otherworldly. The Galapagos Islands were outstanding, especially the snorkeling, the flora and fauna. Thanks for sharing your feedback. We're excited to hear you had a great time visiting the Galapagos Islands and Machu Picchu. We will be sure to pass along your experience with the guides to our tour management team for review. We hope to travel with you again soon! This was a wonderful experience! We had a very full itinerary! There was a LOT of territory to cover so travel time, necessarily, took up a fair amount of time. The naturalists were all very knowledgeable and made our excursions fun. I was impressed with the coordination of the many various aspects of the tour. Snorkeling with turtles and tropical fish in the Galapagos was superb...and riding the Peruvian horses was over the top! Great fun! 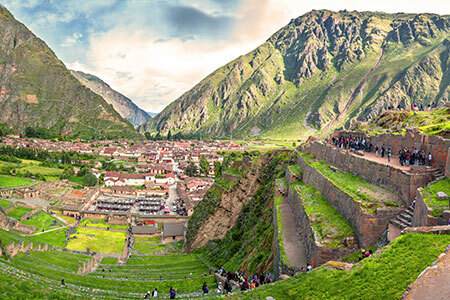 Discover Peru's archeological treasures as you travel through the soaring Andes to the spectacular Incan city of Machu Picchu. 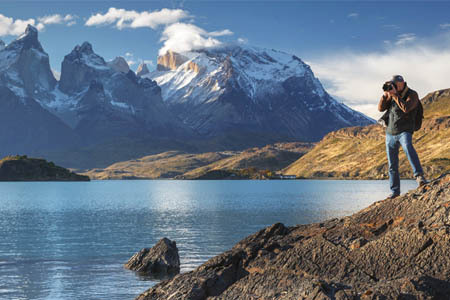 Experience a journey through the stunning natural beauty of Patagonia and into cosmopolitan Rio de Janeiro, home of Carnival, golden beaches, and samba. 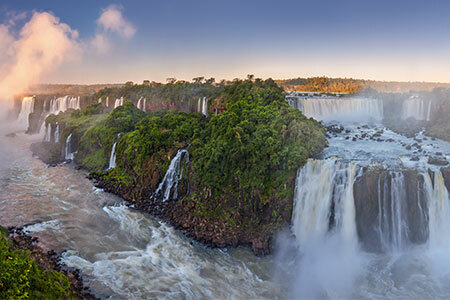 Experience a journey from the heights of Machu Picchu, through the stunning natural beauty of Patagonia, and into cosmopolitan Rio de Janeiro. 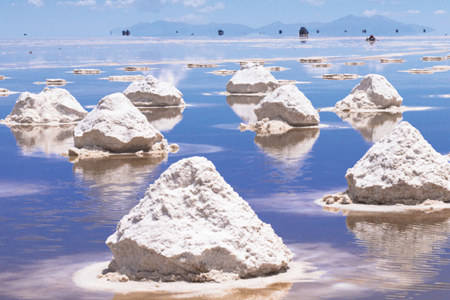 Embark on an unforgettable journey that allows you to discover the ancient history and archaeological wonders that abound across Peru and Bolivia. Fantastic archeological treasures set amidst the soaring Andean peaks – this can only be Peru. Smaller buses, which may not be lavatory equipped, may be used on this program. In this case, frequent stops are made during travel periods. In general, hotels in Peru (outside of Lima) are small with one or two levels and do not have elevators which may require you to climb 10-15 steps to get to/from the room. Each guest is responsible for proper medical documentation and inoculations that may be required and/or recommended to participate on this tour. Please contact your local travel clinic or personal doctor for specific details on the destinations you are travelling to and from. The internal flights on this program are not included in the land price. All air including internal flights can be purchased through us. The days and order of sightseeing may change to best utilize your time on tour. The itinerary is subject to change due to weather conditions or National Park directives. The captain may deviate from the published itinerary for any reason he deems advisable. The normal daily schedule when on board the ship consists of a shore excursion immediately following breakfast, return aboard for lunch, and an afternoon shore excursion. Transfers to/from the boat are by small boats called "pangas." Landings are either "dry" or "wet" and you might have to wade ashore in shallow water. At all times you are accompanied by your naturalist guide. Shore excursions normally last 2 - 2.5 hours each. In some cases, the terrain can be a little strenuous. Passengers should consult their doctor should they have any concerns regarding their physical condition. Children must be 7 years or older. Children under 18 must be accompanied by an adult. Children must be younger than 12 for child reduction to apply. Child rate only applies if sharing a cabin with 2 adults. If the child needs their own bed, you must upgrade to Junior Suite or Balcony Suite (small sofa bed). Highest elevation: Cuzco, Peru at approximately 11,200 feet/3413 metres. *Please note that Collette Foundation sites may not be available for visits due to school holidays, weekends or programming challenges. We pride ourselves on bringing travellers the very best experiences a destination offers. To truly experience the program and destination, you need to be able to participate in physical activities such as walking tours, walking over uneven terrain, climbing stairs and periods of standing. Some of the touring days may be longer, and some of the most unique sightseeing can mean accessing locations that restrict motor coaches, especially in historic areas. In addition, temperatures on this tour can be very high, so bring adequate sun protection. Travel with just 24 passengers on this tour where a smaller group setting means a more personal travel experience. Tour prices may change due to the unique nature of the government restrictions on the Galapagos Islands. Onboard gratuities are not included in the price of your tour. Suggested tipping on board cruise: 15 USD per person, per day, for the on-board crew and 10 USD per person, per day, for the naturalist guides. Single accommodations are limited and will be confirmed upon request and availability from the cruise line. Triple accommodations are not available. Guests arranging their own transfers from Lima's Jorge Chavez International Airport should use a secure taxi service to go into the city. Further information on registered taxi companies is available on the Lima airport website https://www.lima-airport.com/eng and click on the tab Transportation from/to the Airport. **At the Mercure Grand Hotel Alameda, Quito, our guests will be staying in the Deluxe room category. The cabins available are Standard Plus Outside cabins, located on the Sea Deck. Upgrades may be available to Junior Suites (Earth Deck) or Balcony Suites (Moon Deck). Please see pricing for upgrade fees. Cruise ships have a limited quantity of cabins available in each cabin category. We will make every effort to accommodate your cabin category preference at the time of booking. If the cabin category preferred is not available at the time of booking, the next closest category available will be offered and a surcharge may apply. 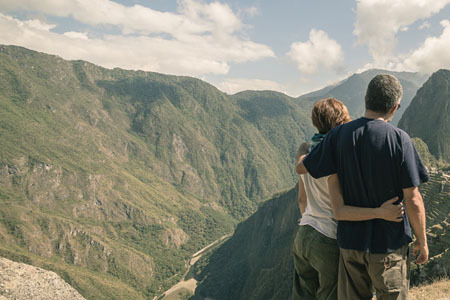 The internal flights on this program in Peru and Ecuador are not included in the land price and must be purchased with the air portion of your tour. Internal flights that are purchased will be ticketed and distributed on tour by your Tour Manager. For passengers wishing only to purchase inter air from us, own air must be arranged into Lima and out of Quito. Required inter flights include four segments: Lima-Cuzco, Cuzco-Quito, Quito-San Cristóbal Island, Baltra Island-Quito. This tour may require a certificate of Yellow Fever inoculation if you have travelled to Brazil, Angola, Democratic Republic of the Congo or Uganda, prior to arrival in Ecuador. These fees are at your own expense. Rates do not include the approximate 165 CAD Galapagos National Park and Galapagos National Institute entrance fees. The currency in Ecuador is the USD. Visitors are required to have valid travel/health insurance to travel to Ecuador. The health insurance must cover medical services abroad. If you have purchased our Travel Protection Plan, your coverage meets this requirement. We will attach a document for proof of coverage that you are required to keep with you while on tour. If you opted not to purchase our travel protection, you will be required to have proof of your own coverage. We assume no responsibility for any expense associated with your failure to obtain coverage or provide proof of this required coverage. We certainly encourage you to buy our comprehensive travel protection that not only covers this requirement; but also allows a full refund for cancellation any time up to the day prior to departure. 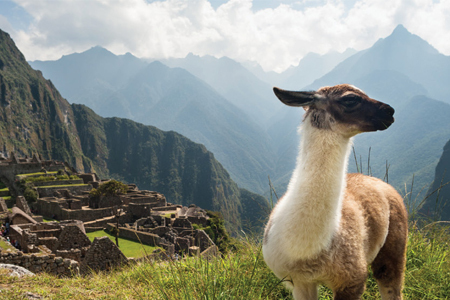 Complete passport information is required 60 days prior to departure to book train tickets to Machu Picchu and to confirm flights to the Galapagos Islands. If passport information is incomplete or inaccurate within 60 days, there is a strong possibility that we will be unable to confirm you on the same travel schedule as the rest of your group. You will be subject to any additional charges incurred from failing to provide passport information within the designated time frame.